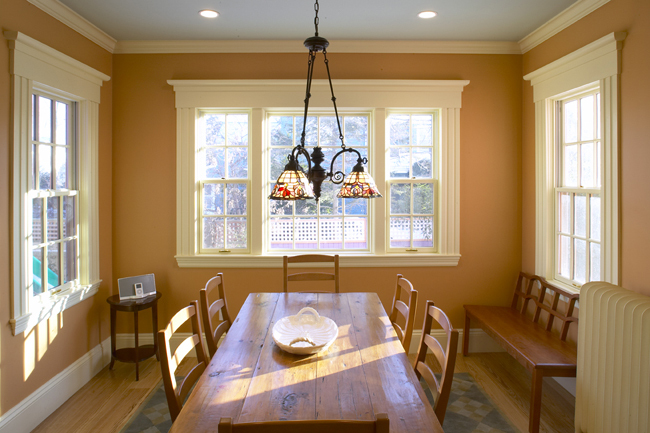 Adding the side windows and raising the ceiling transformed this room into a bright, inviting space. The new windows also allowed better supervision of the kids playing outside. As with the rest of the first floor, this room had a low/false ceiling, probably done during the energy crisis of the 70's. A little architectural archaeology uncovered a fireplace that had been closed-up and plastered-over. We revived it by rebuilding the inside of the firebox and constructing a new mantel and stone hearth.